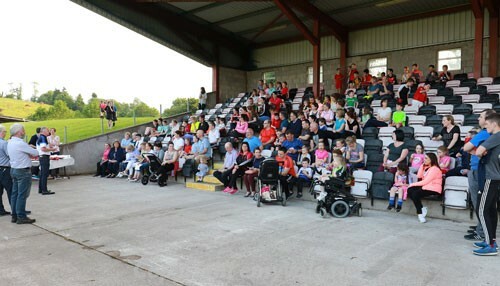 The Launch of the GAA Healthy Club initiative took place on Thursday evening, 31st May, on a beautiful sunny evening, in the seated area of the Francie Treanor Stand at St. Mellan's Complex, Truagh. Thank you to the 200+ people who attended, to the members of our community, committee members, mentors and players from our mens and ladies football teams, juvenile teams, hurling teams and handball teams. The enthusiasm and support which you all showed on the evening was brilliant and created a feel good factor going forward, that we all want and will achieve the very best from this project over the next 18 months and for sustainability within our club in the future. 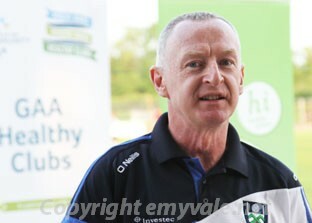 A sincere thank you to Cathal Hand, Health and Well-being Officer with Monaghan County Board, who launched our Healthy Club journey in conjunction with the GAA. He gave a fantastic outline on the benefits of a Healthy Club for all of our community through social inclusion and empowerment. He encouraged all members of our community to get involved. We would like to acknowledge and sincerely thank Michael O McMahon, Monaghan County Board Chairman, for his attendance, contribution and support shown on the evening of the launch and for his continued support as we all explore this exciting journey together as a community. Special thanks to Dean McElroy, Social Inclusion officer, Monaghan Sports Partnership (Monaghan County Council) for his attendance and contribution on the evening. Thank you also to Aoife O'Brien, Healthy Club Officer at National Level, Croke Park, for your continued support. A special word of thanks to Rachel McKenna (The Master) senior ladies football player (Gaeil Triucha and Monaghan County Ladies team) for your help on the evening of the launch and for your continued support. We would like to take this opportunity to wish you and all your fellow Monaghan team the best of good luck on this Saturday evening 9th June as you take on Donegal in the Ulster Ladies Semi Final at 7pm, in Healy Park, Omagh. Thank you also to Total Produce Dundalk and Lidl Monaghan for their very generous sponsorship of the fruit which was distributed to everyone in attendance. Thank you to the members within our community who have signed up in becoming part of our Healthy Club Team and to all who have completed expression of interest forms. The information recorded will form the basis going forward in the journey of this GAA initiative. Expression of interest forms are still available for you to have your say as to what you would like to see and achieve for your own personal well-being - From the following:- Martin Treanor, Club Shop (Thursdays 7.30pm-8.30pm), from the Club House or please contact our Healthy Club Officer Pauline McCarey, on Mobile 087 4300 770 or email paulinemccarey@hotmail.com (if you would like a copy of the expression of interest form or for further information). completed forms can be returned to Pauline McCarey or please post them through the club postbox at St.Mellans. This project is an exciting partnership involving Healthy Ireland, the HSE, the National Office for Suicide Prevention, the Public Health Agency and Irish Life. 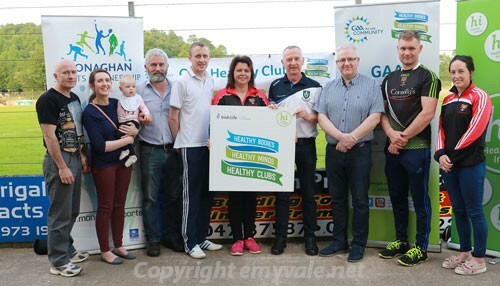 UPdate 1: Pauline McCarey Healthy Club Officer, Gaeil Triucha and Francie (Peadar) McKenna from the Healthy Club Team, Gaeil Triucha, attended the Ulster Healthy Club Provincial meeting which was held on Wednesday evening past 20th June in Kelly’s Inn, Garvaghey, Ballygawley, Co.Tyrone. 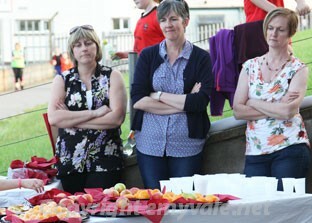 The event was organised by Aoife O'Brien, from the GAA, Healthy Club Officer at National Level, who is based in Croke Park. This event marks the start of exciting times ahead for our club through inclusiveness and empowerment over the next 18 months and beyond. Please embrace this opportunity by completing an expression of interest form if you have not already done so, to have your say as to what you would like to see for your own personal wellbeing. The information which you provide will form the basis of having events/classes/talks etc, right on your doorstep in the friendly and inclusive environment of your local GAA Club, Gaeil Triucha. Where everyone in our community from the young to the young at heart regardless of their ability, will feel like a winner and feel empowered by being part of this exclusive GAA initiative. 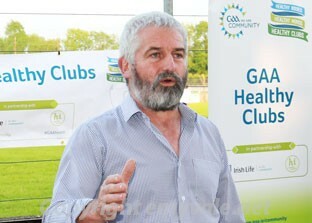 Gaeil Triucha are proud and privileged to be selected by the GAA to take part in Phase 3 of The Healthy Club Project. The project is an exciting partnership involving Healthy Ireland, the HSE, the National Office for Suicide Prevention, the Public Health Agency and Irish Life. It is designed to increase GAA clubs' ability to support healthier lifestyles and in doing so enhance the positive influence in the community of Truagh. Expression of Interest forms are available from Pauline McCarey (Healthy Club Officer) email: paulinemccarey@hotmail.com or mobile 087 4300 770, from the club shop (opening hours) Thursday evenings 7.30pm to 8.30pm or from the club house within St. Mellans Complex. Please leave completed forms in an envelope through the postbox at St. Mellans marked for the attention of Pauline McCarey (Healthy Club Officer, Gaeil Triucha). 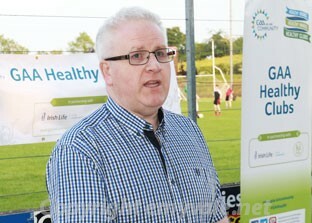 "Gaeil Triucha at the Heart of your Community, GAA We Are Community and Healthy Bodies, Healthy Minds, Healthy Clubs ".